Why do we still use plastic bags? Because a more convenient and attractive alternative has not yet caught our attention. Capacity: A light bag holds more weight than a bag of any other material. 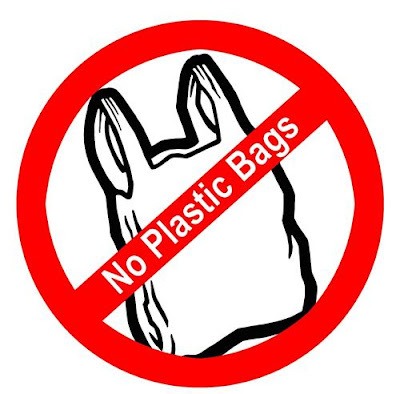 Reusable: A supermarket plastic bag is often reused for packing other items, larger bags to carry files, books, etc. Clogging litter: Thousands of plastic bags lay strewn about the city. They clog drains, choke water bodies of life, strangle the land, block gutters and unlike paper, they degenerate over a long (looooooong) period of time, and with NOTHING being done to counter its pollution, plastic bags continue to grow as a menace. SAY NO to plastic bags at the shops and malls you go to. Instead, carry a cloth or plastic bag you already have at home from an earlier purchase. Discourage the use of plastic bags in your locality with the distribution of complimentary cloth bags. There will always be an NGO in your city eager to help you. You only have to contact them.